That's a wrap! Annabelle 3, the next chapter in The Conjuring universe, has officially finished filming. Production kicked off on the movie in October and after a couple months of capturing some more scary business centered on cinema's most unsettling doll, the cast and crew have left it up to the post-production team to get this thing ready for theaters next summer. The news was confirmed by photographer Justin Lubin, who was working on the movie. 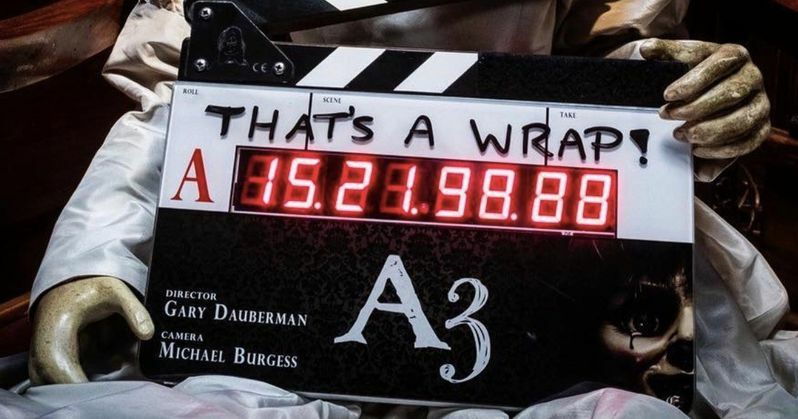 Lubin took to Instagram to share an image of the clapboard with the words "that's a wrap" plastered on it. The board also highlights director Gary Dauberman and director of photography Michael Burgess. Lubin had this to say in his caption. "That's a wrap on Annabelle 3!! What a great cast and crew!!" Gary Dauberman is actually making his directorial debut on Annabelle 3. Dauberman has served as a longtime writer of the franchise, having penned the previous two installments of this particular spin-off series, as well as this year's The Nun. Additionally, he's proved to be a horror hitmaker for Warner Bros. in general, as he helped write last year's IT, which is now the highest-grossing horror movie of all time. So, there's reason to think putting him behind the camera for an entry in one of their most reliable franchises may not be such a bad idea. Dauberman penned the screenplay for this upcoming entry as well. The studio has yet to release an official plot synopsis or title for the movie. However, it was revealed during San Diego Comic-Con that this will basically be a horror version of Night at the Museum. Patrick Wilson and Vera Farmiga are set to return as Ed and Lorraine Warren for the first time since The Conjuring 2. But they won't be the ones being tortured by Annabelle this time around. Instead, it's their young daughter, played by McKenna Grace (Captain Marvel) and her babysitter who are going to end up dealing with her horrors. James Wan, who has since gone on to tackle mega-budget blockbusters such as Furious 7 and the upcoming Aquaman, kicked off this universe with The Conjuring in 2013, which proved to not only be a huge success at the box office, but a big hit with critics. That blossomed into a franchise, complete with several spin-offs that have all proved to be financially successful. Though, in the case of the first Annabelle and this year's The Nun, critics aren't always on board. But that doesn't seem to matter, as The Nun is now the highest-grossing entry in the series, having brought in $365 million globally. To date, the five movies so far have made $1.56 billion, making it one of the most successful cinematic universes around. Additionally, Warner Bros. and New Line are developing a spin-off centered on The Crooked Man and The Conjuring 3 is currently in the works, with Michael Chaves (The Curse of La Llorona) on board to direct. Annabelle 3 is currently set to hit theaters on July 3, 2019. Feel free to check out Justin Lubin's Instagram post below.